A lot to catch up on . . .
1. 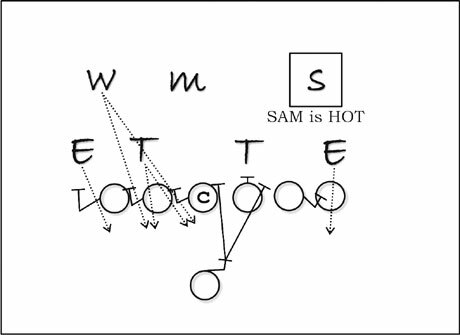 Great article on one-back (six man) pass protection. 2. BCS mania: The good Senator has consistently been one of the best voices on this BCS debate, so read up here and here. (And Dr Saturday has an informative response.) I generally agree that the whole thing is much ado about nothing, and a secret part of me wants the "PLAYOFFSSSS!" contingent to win so that they realize the imperfection of what they merely assumed would fix all the sports' ills. Specifically, absent from the debate -- along with an elementary understanding of the economics of college football, or just economics at all (with claims of socialism being thrown around) -- is an understanding of what National Champion is supposed to mean. The BCS does a pretty good job of finding the best overall team in terms of who would probably be favored to win against any other opponent. That excludes teams like Utah, but is a playoff unequivocally the best option? Were the New York Giants better than the New England Patriots two years ago? No, of course not. Maybe there are other benefits, but I don't think "fairness" is one of them. Or, as the Senator notes, if you want to talk about "fairness" in a meaningful way, then you're in the territory of "revenue sharing," which the NFL has to keep parity but is a strange thought when it comes to college sports. 4. It's good to see that Kansas State fans can have a good laugh at their own expense. (H/t Sporting Blog). 5. The Mike Leach contrarian: T. Kyle King of Dawg Sports opens up two barrels of eloquent assault on Mike Leach. King says he doesn't know anything about the guy personally, but finds Leach's public persona -- particularly his recent comments about NFL coaches and the past two Texas A&M staffs -- "rude," "childish," and "churlish." (Nice.) I can't do the whole post justice (go read it) but a lot of it is based on the question: What in Leach's resume gives him the right to "demean his coaching coevals?" I've already said my bit, though I agree with Kyle that one reason Leach gets so much love from coaches (well, at least ones who aren't the subject of his criticism) and commentators is that he good for such quotes. The only thing I'll add is this: most of Leach's comments have come in the context of him trying to defend his players, though in his case it is special because much of the criticism of the players reflects on him. Most perspicuously, think Graham Harrell not getting drafted -- a "spread" quarterback. Harrell, unlike past Leach quarterbacks like Sonny Cumbie or Cody Hodges, turned down several other fairly big name schools to play for the Dread Pirate, and much of the criticism of Harrell came in the form of questioning what Harrell had been doing under Leach's tutelage. By contrast, guys like Stephen McGee -- who I actually assume that Leach had always respected as a player but probably marveled at how lamely he was used -- were drafted in spite of all coaching. 6. Four-verticals: Cheesehead TV identifies an example of the Green Bay Packers running the four-verticals concept from a five-wide set. (For another example of four-verts, check out this post.) See the clip on the NFL website here. 8. Malzahnitude: The Joe Cribbs Car Wash combines two things I generally enjoy but am not universally enamored with: Gus Malzahn (new OC at Auburn) and Malcolm Gladwell. It's worth the read. One brief thought on Malzahn, however. Gus's big thing is that he believes in tempo. Of course, he hasn't really had a chance to go breakneck speed yet at Auburn (at least by the reports of those who have seen both Tulsa, his former stop, and Auburn practice), though the offense is apparently looking much better already. Ironically, he's improved -- over both Tuberville's prior offense and the Tuberville Franklin mash-up -- by just bringing some sound, simple schemes. Sure he has a lot of window dressing, but that offense had just gotten bad. Yet, at least in year one I'll be surprised if he works miracles. What they did at Tulsa was wonderful, but Herb Hand -- who brought the zone blocking aspect of the running game to go with Malzahn's pace and power game schemes -- was an integral part of the Tulsa attack: they were co-offensive coordinators for a reason. And though Malzahn seems reasonably committed to the running the ball, he was always a pass first guy, so we'll just have to see how that flies without a true quarterback. And the X factor is Chizik, the head coach. Even if Malzahn's offense is good, there are few defensive minded guys who appreciate a three-and-out (which can happen to any offense) that takes about eight seconds to occur. How long is his leash? Time will tell. Kyle makes a good point about Leach he lacks the resume to run his mouth like he did. The reason McGee was drafted higher because he has the arm strength of an NFL QB Harrell doesn't. The biggest problem with "spread" QBs in the NFL passing game is built on the intermediate route(10-20 yard throws) and play action you don't see either thing in a lot of spread offenses. Mike Mayock charted Graham Harrell and Chase Daniel's throws fpr the season and he found out 90% of their throws were either under 10 yards or fly routes no intermediate routes. Tim Couch, Big Ben, Flacco were drafted high and Bradford would have been a first rounder this year if he enter. All of those guys played in shotgun based offenses that you could classify as a spread. But they all showed requisite arm strength, thrown enough intermediate routes, went play action under center enough and showed requisite arm strength. 1) Arm strength is overrated. I'd take a Chad Pennington over a Culpepper, Leftwich, or Leaf. Decision-making and accuracy with a threshold measure of arm strength is what makes for NFL success. 2) re: BCS and money -- the BCS schools have shown that they are far more interested in taking the biggest possible share of the pie instead of making the pie bigger. Just look at the basketball tourney. The runs by George Mason and Davidson had the BCS commissioners putting the screws on the selection committee to reduce the number of mid-majors and force them to play against each other. Everything possible to avoid the embarassment of having a mid-major defeat a BCS team. Yet, we know that the huge money from CBS comes from ratings that are built on casual fans who root for Cinderella (Davidson-Kansas had twice the audience of any of the other regional finals in 2008). By screwing the mid-majors at every turn (and the NCAA does), they are driving TV ratings down. They are choking the golden goose in their effort to hoard every possible dollar. Understanding the mentality which drives such "pound foolish" decisons in basketball can inform predictions of how the football scenarios will play out. Hi Chris - Hope you had a good time at the Derby - did you hit the long shot by any chance? This plus Rockerbie's article and some other reasons are why I don't put too much into the regression angle on stats & winning. Too many holes to plug. http://smartfootball.blogspot.com/2006/07/runpass-balance-response-to-comments.htmlAnyway, I don't think the regression thing isn't all bad, but as you said, you can't go trotting off right away with supposedly firm answers.